Counter-terrorism police have approached the parents of a student who was arrested during a protest earlier this year at Birmingham University, asking to discuss ‘concerns’ about his behaviour. 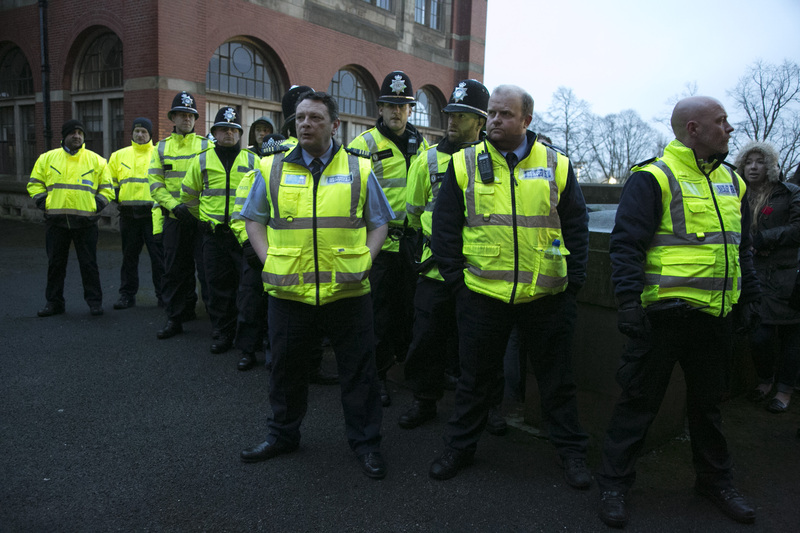 Thirteen students were arrested for offences including aggravated trespass, assault and criminal damage at the demonstration in January 2014, which saw West Midlands Police officers kettle protesters for up to four hours, with no access to food, water or toilet facilities. By the end of March, the CPS had dropped all charges against the defendants due to lack of evidence and five students suspended by the university were reinstated. Last week, however, the parents of one of the students suddenly received a letter from a West Mercia Police officer, Detective Constable Jemma Greenow, who said she was “working within the Prevent agenda, part of the Contest Strategy, which is the Government’s strategy regarding Counter Terrorism and Domestic Extremism”. Greenow indicated that she had been asked to get in contact by West Midlands Police, “who have received some concerns about your son”. I am aware that this may be of concern to you and would like to invite you into the local police station to discuss the concerns. Just to reassure you, Prevent is about supporting individuals who may be involved in Domestic Extremism, not about criminalising them. Your son is not in any trouble, however as concerns have been raised we would just like to discuss them with yourselves, before speaking to ••••• as the concerns have been raised whilst he has been at University. It is unclear why West Mercia Police decided to approach his parents first, as the student is over 18 years old and legally an adult. ‘Prevent’ is a strand of the government’s strategy to “stop people becoming terrorists or supporting terrorism”. A visit to the parents of a young person considered “at risk” is usually part of a process known as “Channel”, which the government describes as “safeguarding children and adults from being drawn into committing terrorist-related activity” by “early intervention to protect and divert people away from the risk they face before illegality occurs”. Most interventions have overwhelmingly targeted young Muslims, particularly young people and students, with the explicit intent of depoliticising them and restricting radical dissent. Alarmingly, they also stigmatise young people by drawing in a range of other agencies, including local councils, schools and colleges, whose staff are encouraged to spy on and report their suspicions to the police. However, the Channel process is so lacking in transparency that there is almost no information on when or how often it is used, or when it also targets other kinds of so-called “domestic extremism” (a term that has no legal definition). Instead, the police have interpreted ‘radicalism’ to mean whatever they want it to mean: in June, for example, Inside Housing magazine quoted one Greater Manchester Police officer judging potential ‘extremists’ based on “a gut feeling”. He added that the political objectives of extremism “could be to stop fracking, Fathers for Justice [or] anti-immigration”. Clearly West Midlands Police, who made the initial referral, had a gut feeling that opposition to higher education cuts is potential “extremism” too. This is yet another example of the scale and ambiguity of police recording of protesters as ‘domestic extremists’ that Netpol has repeatedly raised and that has included some high-profile targets. The student and his family are now considering a formal complaint and Netpol is seeking clarification from the West Midlands Police and Crime Commissioner about the appropriateness of using counter-terrorism tactics against student demonstrators acquitted of criminal charges.